A challenge with scientific and human implications. An interview with Florence Chiodini, PhD. .Geneva University Hospital (HUG) is the largest medical establishment in Geneva city and canton. It has a long history of excellence and is seen as one of the most important medical institutions in Switzerland. Attached to the Faculty of Medicine of Geneva University, it is also a radiant research centre. And what’s more, the hospital is an integral part of a region called West Switzerland, reputed as a fertile ground for innovation in biotechnology and the life sciences. One of HUG’s strong points is their clinical research. Through close and active collaboration with the World Health Organisations (WHO), HUG reaches a world-wide scientific audience, enjoying strong recognition both nationally and internationally. Florence Chiodini, PhD, is a biologist at HUG’s Ophthalmology Clinic. She is in charge of coordinating the Geneva Cornea Bank’s activities. 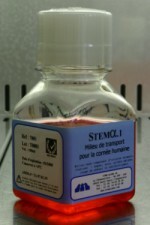 The Geneva Cornea Bank (BDCG) is a part of HUG’s Cell Therapy Laboratory. At macro level, it provides a service regulated by the Federal Office of Public Health (FOPH) which is part of the Federal Department of Home Affairs. But before going any further, the image here below lets us situate our eye’s cornea. 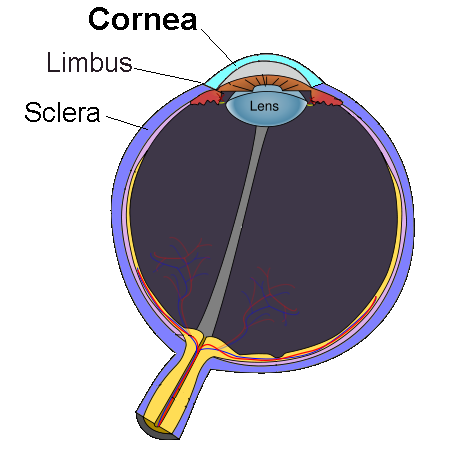 The cornea is the transparent front part of the eye that covers the iris, pupil and anterior chamber. The cornea, with the anterior chamber and lens, refracts light. Florence Chiodini, what’s your role? 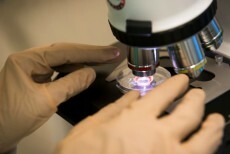 We’re a laboratory that analyses, preserves and distributes corneas. I am in charge of coordinating the Geneva Cornea Bank’s activities. Running a Cornea Bank is a highly regulated and controlled affair. When a person dies at HUG, clearly established processes come into play. 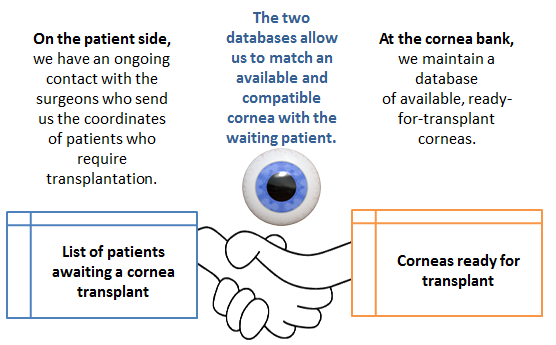 Specific databases match corneas with patients. An important task that is assigned to me is the maintenance and management of up-to-date databases. How does the cornea transplantation process work? There are three demanding steps a cornea has to overcome before it may enter into the Geneva Cornea Bank. The person responsible for the cornea bank communicates with the local donor coordinators who do the identification of potential cornea donors. When a person has died, they consult the medical record. During one year, there are between 1200 and 1500 deaths at the Geneva University Hospital. When no contra-indications are found to cornea donation, the coordinator contacts the relatives to seek consent for cornea donation. This standard procedure is always performed, even if the deceased person already gave his agreement on a donor card. When consent is given and no other medical contra-indications are found, the coordinator organises the procurement of the corneas by an ophthalmologist. The corneas are placed in separate sterile receptacles, containing a biological solution which ensures their conservation. They are then deposited at the cornea bank by the coordinator and stocked in a special chamber for a period of quarantine. The biologist is responsible for their reception and storage until serological, bacteriological and morphological analyses are complete. Corneal transplantation, also known as corneal grafting or Keratoplasty is one of the most performed transplantation operations in the world. Over 100’000 interventions happen every year. In Switzerland, the number is around 500. However, we have a cornea shortage in our country, with an estimation of 800 patients awaiting a cornea transplant. Cornea banks can also be found in Bern, Zurich, Lucerne, Olten and Lausanne. In Geneva, the number of patients awaiting a cornea is estimated to be around 80. Corneas spend only a short time at the cornea bank, 30 days being the maximum. Once admitted and ready, our challenge is to collaborate with the ophthalmologic surgeons, set priorities and get the precious tissue to the patient who needs it most. NB: Did you know that corneal transplantations are being practiced since 1887? The physician who performed the first operation was Dr. Arthur von Hippel (1841-1916). What makes your Geneva Cornea Bank and Laboratory special? 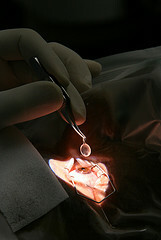 A cornea transplant in progress. Rules and regulations surrounding all activities of a cornea bank are plentiful and require our utmost attention. Geneva is a new cornea bank. We came into operation in March 2013 and we apply the most up-to-date scientific knowledge and best practice to both the bank’s infrastructure and related processes. For example, we work in a Clean Room, see next chapter. All our processes have been certified by Swissmedic, the Swiss agency for the authorisation and supervision of therapeutic products. Geneva Cornea Bank (BDCG) meets the highest health safety regulations, set by both Swiss and European authorities. Images provided by HUG Communications Department. Our laboratory in Geneva is the only one in Switzerland to dispose of such a space. 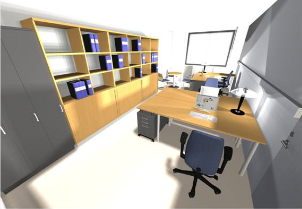 A Clean Room, in French “Salle Blanche”, is a well-defined area where key parameters such as temperature, humidity and pressure are constantly maintained at pre-determined levels – hence preventing environmental contamination. 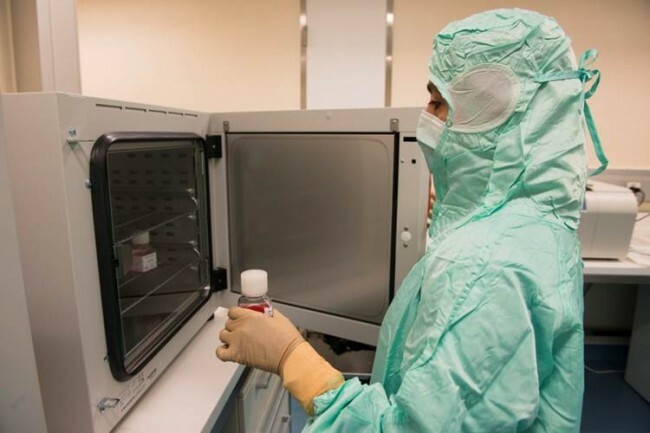 This will no doubt change in future, as regulations evolve and the availability of a Clean Room becomes mandatory. 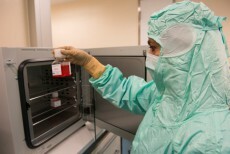 At present, our certified Clean Room reinforces Geneva University Hospital’s (HUG) reputation for excellence, and gives us a powerful strategic advantage. What made you sign a partnership with NV Logistics? As you’ve seen in the previous passages, the field we operate in is delicate and highly regulated. An absolute must is certification by Swissmedic, Switzerland’s regulation body. We could not possibly implement the best of all processes internally (the procedures that define how corneas enter our Cornea Bank) and then fail when we release and distribute (transport) the tissue to its final destination. We must work with Swissmedic predefined procedures and regulations at EVERY STEP of the process. 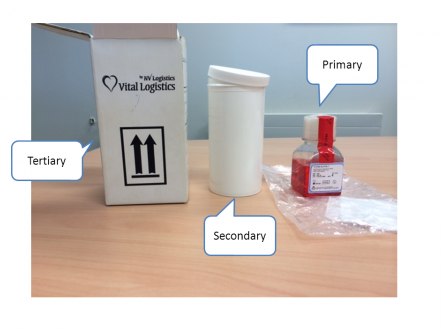 NVLogistics, and more specifically Vital Logistics, their biological and pharmaceutical transport division – are currently the only independent transporter in the French part of Switzerland to be Swissmedic certified. This key factor, combined with their excellent reputation, made it easy for us to select NVLogistics as our preferred shipper and partner for the Cornea Bank project. With NV Logistics we’re worry-free. As previously stated, we operate with full certification at all levels of our supply chain and as such, we only collaborate with organisations who are Swissmedic certified. A transporter such as certified NV Logistics is able to provide us with all the authorizations necessary – Swiss and European – to transport our corneas within Switzerland and Europe. The transporter with whom we partner must be able to implement existing protocols & regulations regarding temperature, time, traceability and specific packaging. Let’s take “Packaging” as an example. NV Logistic’s advice has been precious. Our many open and stimulating discussions culminated in a customised packaging solution which fulfils our very specific needs. Corneas are immersed in a biological solution which ensures their conservation. Maintaining the solution at pre-defined and constant temperate levels is essential for keeping the tissue at its optimum state. We achieve this with a Triple Layer System for packaging and a fleet of vehicles which are equipped to maintain temperatures at requested levels. The primary receptacle: Sealed plastic flask (packed in a leak proof plastic bag). The secondary receptacle: a sealed pot. The tertiary receptacle: an aluminium-clad thermo protection box. Do you work exclusively on Swiss territory? Since going operational in March 2013, the majority of cornea shipments occurs on Swiss territory. As far as Europe, we maintain close collaboration with the Tissue & Cell Bank of the Lyon Civil Hospices – Les Hospices civiles de Lyon (HCL) – with whom we’ve signed an Interbank Convention. In case of an emergency, we can exchange matching corneas. Having a transporter who can handle international transport immediately and with all necessary certification is obviously a great advantage for all concerned. The HUG Press Release (in French) announcing the opening of the Geneva Cornea Bank (April 2013). This interview was conducted by Piero Zappaterra while a student at HES So. Piero is candidate for an MscBA in Orientation Management and Service Engineering.